Existing conditions drafting is the act of drawing (i.e. drafting) field measurements that were taken of an existing structure. In other words, it’s the act of creating existing conditions drawings. This blog post is my third project summary, as part of an on-going series of blog posts that I’m doing under the category of project summaries. The posts are for prospective clients who may find the information and samples useful as estimating tools, or just as a way to acquaint themselves with my drafting services. This third project that I’m covering today was one that I did this past June. the subject is a residential house located in New Jersey. I’m based in New York City, but I take on projects outside of the NYC area. Type and Location: Three story residential house located in New Jersey. 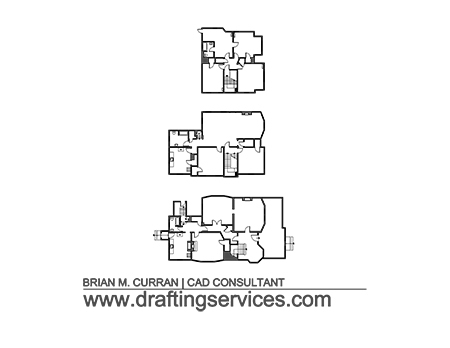 Scope: Create basic floor plan drawings of the first, second and third floors of the house. Was the space occupied with tenants? : No. The house was vacant. Equipment Used: Hand held laser, tape measure, camera (optional), pens, pencils, eraser, paper and foam board. Comments: This house had been through an interior fire, so it could not have been drawn by measuring the space while drafting the measurements directly into an onsite laptop. Therefore the measurements were written down on field sketches, and then drafted at another time. Furthermore, even though this house had suffered some interior fire damage, it was pretty easy to measure and draft. It did not have terribly complicated geometry, interior details, nor was it very much out of square. That’s all for this post. Please check back in the future for new posts, or subscribe via the Subscribe box to the upper right. Subscribing would cause my blog posts to be automatically sent to your email inbox. This entry was posted in Project Summaries. Bookmark the permalink.